Hello I just bought a 95 Z28. The engine is overheating severely(all the way to 260* if I let it, so I immediately replaced the thermo with a new 180*, and thought my heater core was bad. The heater core is ok, but I realized that my fan wasn't working so I replaced that and wired it to the ignition so that it is on always, and I am still having the same overheating. I checked all hoses and I think it is what I feared from the beginning. I think the water pump is bad. The water bubbles up and overflows out of the radiator after about 6 or 7 minutes of idle. At first I thought that was a sign that the pump was working, but then I realized no flow is happening, just back pressure. Has anyone had this problem and did changing the pump fix it? I have eliminated or replaced everything else. Last edited by salimlt1luv; 06-08-2009 at 01:00 PM. 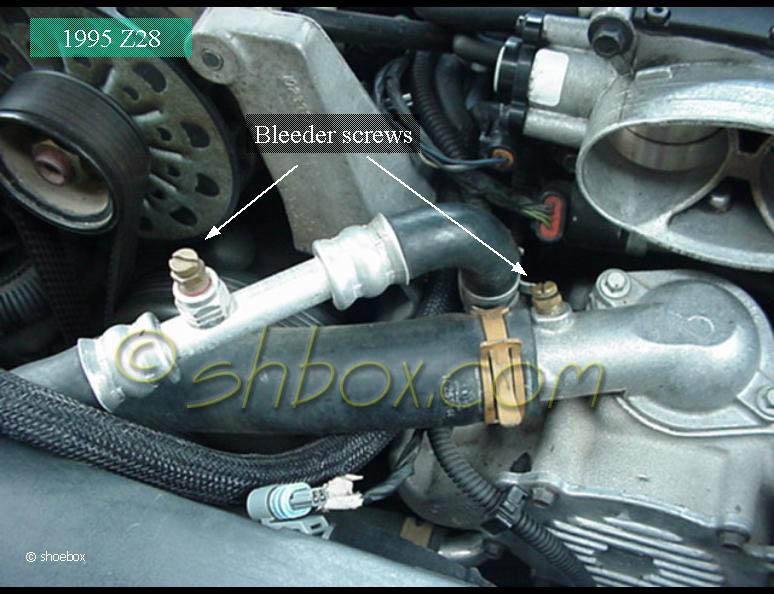 Water pump is fairly easy to change but have you bled the lines? There are two screws on hoses to the left of the throttle body. Put a rag under each then turn them with a screwdriver to open. Open till water comes out then close them and see if that helps first. if it is your water pump ive got one ill sell for 50 bucks, i just went to an electric one. thanks, I tried bleeding one the screws but not both. I di have some water come out and wasn't sure that was a good thing... I will try it again and be more patient. If water is actually moving through the engine, is that an indicator when it bleeds? How long should I let it, at one point it was steam coming out from the bleeder screw. I attributed that to the fact that there is nothing but water going through as all the coolant has been flushed. I welcome all suggestions. Open both at once. If you see bubbles keep them open till it's just straight water. You don't have to let much through, less than a 1/2 teaspoon is good enough. i'll try that tonite and let it run for a few... if it gets too hot I'll shut her down. till i get the water pump... i did notice there is a connector/ plug on the side of the radiator that i don't see a plug or wire that is supposed to go there... i might be reaching but is there any plug or sensor that is supposed to plug there... and where is the coolant temp sensor located... and is it a factor since i hard wired my fans to the ignition so they comeon when i start the car and stay on. The coolant temp sensor for the PCM (fan control) is on the front of the water pump, drivers side towards the bottom, it could be faulty as well (I assume it would set off the SES light) you can replace it for cheap. I would also check the fan fuse and relay if it hasnt been verified yet. Does the PCM command teh fan when the A/C is switched on? Just a few ideas off the top of my head. the steam coming out was air in the system. when it heats up hold the return hose going to the radiator and see if its hot and water is flowing. bleeding it is not an indicator that the wp is working. i bleed mine once and the shaft was not installed so it was not moving any water. here's latest, i ran her for a few this morning and openned both bleeders. when she got up to about 235-240 she started spiting air and steam from the bleeders. Then i revved the engine a few times. when i revved to 1500rpm the temp drop to 210 and as soon as i let off the pedal the check gauge light came back on and the temp shot back up to 235. I revved it again to 2000 and held it and again the temp dropped to 210 and held, as soon as i lifted it rose agian. Then she got really hot and shut off. I panicked because I thought I blew it, but she started rightup after coolingdown. So any suggestions out there? I still plan on replacing the water pump this weekend. By the way hardwiringthe fan to the ignition works well, no issues with fan any more. by the way, what's the best way to know for sure that the water pump is working. I know it may sound simple but I'm trying everything I can think of at a time. How should it be grounded? Everything looks good , but when I replaced the T-stat it was not full of water, in fact it looked pretty clean , the old T-stat was wet but there wasn't any water in the pump. also I discovered the overflow tank has a huge hole , so it's useless would this contribute to the overheating? Last edited by salimlt1luv; 06-09-2009 at 03:17 PM. im not an expert but since it did cool down the pump is working atleast a little bit. if it wasnt i would not cool at all just keep rising. im sure someone else can let you know whats going on. Head gasket maybe? Im going through the same thing. I bled both spots but I have the water shooting out of the overflow. Mine didnt bubble until a couple of mins either(warmed up). I think the head heats up and lifts the blow out but wont know for sure until I do a pressure test Friday.My oil is clean too. Did you mean some water was bleeding out and it started spitting when it got really hot? Is there steam going out the tailpipe? If no evidence of water leaking and no steam it kinds of leads me to think it's the pump. An old way to know was to turn on the heater. If the heater didn't get hot then it showed the water wasn't flowing. Quick Reply: Overheating LT1, help! !